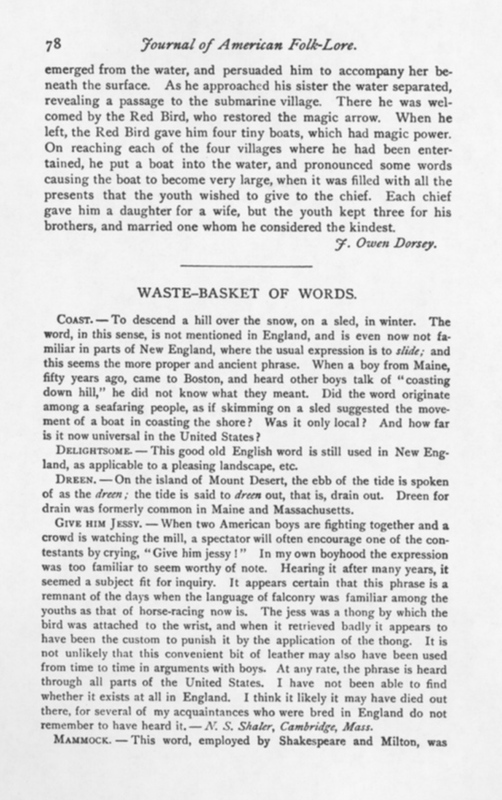 The author began these abstracts in a series of letters to "The American Antiquarian and Oriental Journal" of Chicago. These myths were dictated to the author by the Indians in their own language, the Çegiha. They will be published by the Bureau of Ethnology in "Contributions to North American Ethnology. Vol. VI. The Çegiha Language. Part I. Myths, Stories, and Letters." 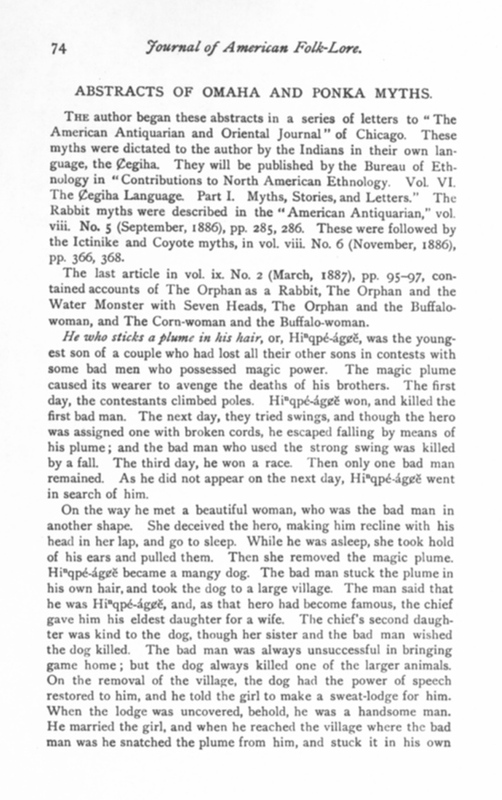 The Rabbit myths were described in the "American Antiquarian," vol. viii. No. 5 (September, 1886), pp. 285, 286. These were followed by the Ictinike and Coyote myths, in vol. viii. No. 6 (November, 1886), PP. 366, 368. 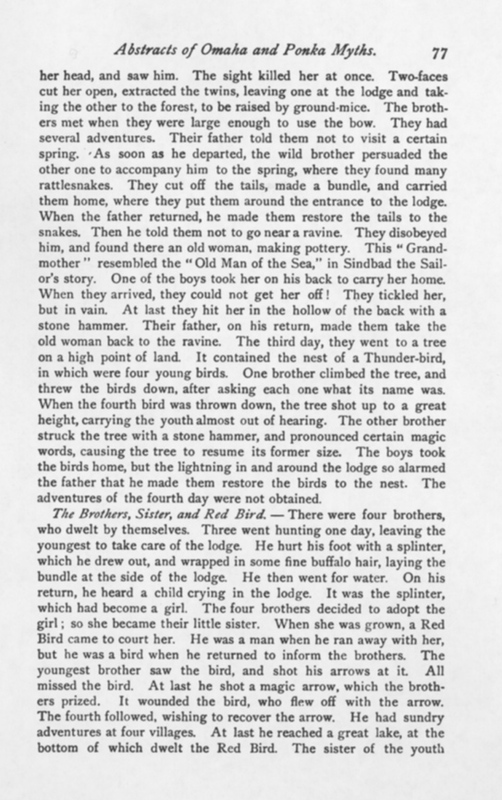 The last article in vol. ix. No. 2 (March, 1887), pp. 95-97, contained accounts of The Orphan as a Rabbit, The Orphan and the Water Monster with Seven Heads, The Orphan and the Buffalo-woman, and The Corn-woman and the Buffalo-woman. He who sticks a plume in his hair, or, Hiⁿqpé-ágçĕ, was the youngest son of a couple who had lost all their other sons in contests with some bad men who possessed magic power. The magic plume caused its wearer to avenge the deaths of his brothers. The first day, the contestants climbed poles. Hiⁿqpé-ágçĕ won, and killed the first bad man. The next day, they tried swings, and though the hero was assigned one with broken cords, he escaped falling by means of his plume; and the bad man who used the strong swing was killed by a fall. The third day, he won a race. Then only one bad man remained. As he did not appear on the next day, Híⁿqpé-ágçĕ went in search of him. hair. When he kicked the bad man, the latter became a mangy dog, that was killed at once by order of the chief. The hero was very useful to the tribe, bringing in much game. Then the widow of the bad man said to her sister, "Let us have your husband together." But the wife reminded her of her former cruelty to him. After a while the hero returned with his wife to his own country. The elder sister followed them, though not invited. When they reached his father's lodge, behold, the parents were very poor, and the crows had picked out their eyes. The sister-in-law restored their sight, and was rewarded by being made the wife of Hiⁿqpé-ágçĕ. The Chiefs Son and the Thunders.—The chief's son had been lazy, but he had a vision, which caused him to make up a war-party. They met an aged Thunder-man, whom they did not recognize, and who seemed very poor. He rewarded their kindness by giving the leader an otter-skin bag and a club that could make thunder. The leader sent out scouts each day, charging them not to molest any of their "Grandfathers" whom they might encounter. 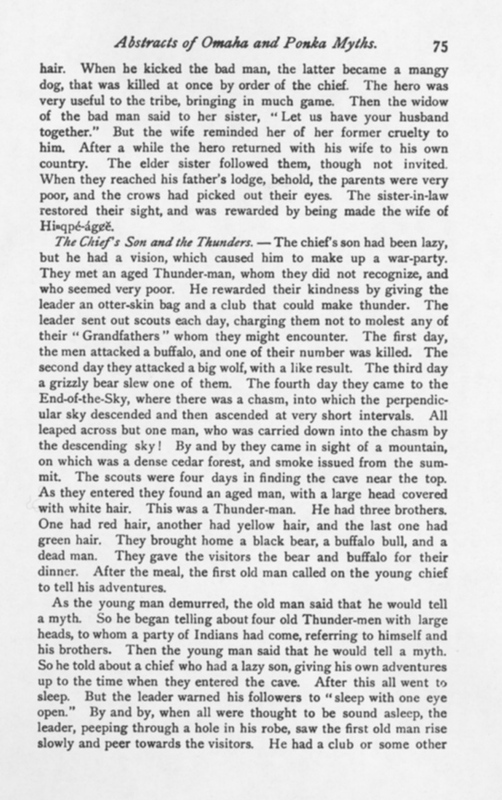 The first day, the men attacked a buffalo, and one of their number was killed. The second day they attacked a big wolf, with a like result. The third day a grizzly bear slew one of them. The fourth day they came to the End-of-the-Sky, where there was a chasm, into which the perpendicular sky descended and then ascended at very short intervals. All leaped across but one man, who was carried down into the chasm by the descending sky! By and by they came in sight of a mountain, on which was a dense cedar forest, and smoke issued from the summit. The scouts were four days in finding the cave near the top. As they entered they found an aged man, with a large head covered with white hair. This was a Thunder-man. He had three brothers. One had red hair, another had yellow hair, and the last one had green hair. They brought home a black bear, a buffalo bull, and a dead man. They gave the visitors the bear and buffalo for their dinner. After the meal, the first old man called on the young chief to tell his adventures. weapon in his hand, and just as he was about to attack the Indians their leader sprang to his feet, whirled his magic club around his head four times, making thunder, which killed all four of the Thunder-men! Then he ordered his men to take the four scalps entire, without marring them. On the way back he rescued the four men who had been killed by the End-of-the-Sky and the animals. All his warriors received garments made of human scalps. Finally, the young leader was made the head chief over several tribes. 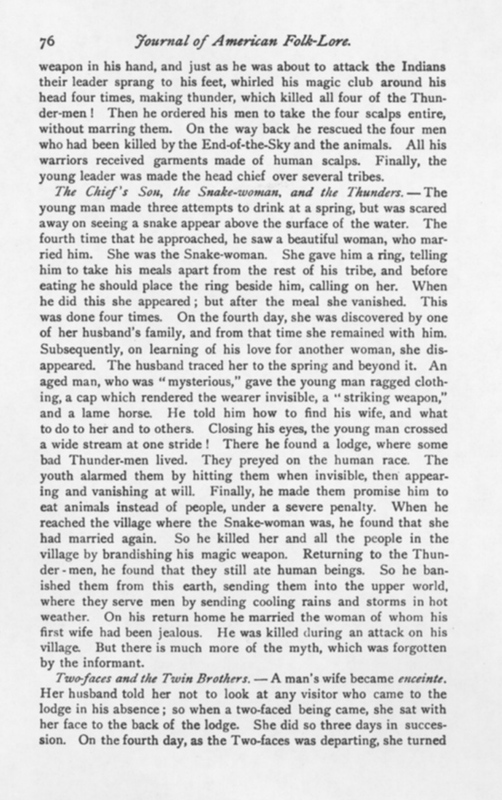 The Chief's Son, the Snake-woman, and the Thunders.—The young man made three attempts to drink at a spring, but was scared away on seeing a snake appear above the surface of the water. The fourth time that he approached, he saw a beautiful woman, who married him. She was the Snake-woman. She gave him a ring, telling him to take his meals apart from the rest of his tribe, and before eating he should place the ring beside him, calling on her. When he did this she appeared; but after the meal she vanished. This was done four times. On the fourth day, she was discovered by one of her husband's family, and from that time she remained with him. Subsequently, on learning of his love for another woman, she disappeared. The husband traced her to the spring and beyond it. An aged man, who was "mysterious," gave the young man ragged clothing, a cap which rendered the wearer invisible, a striking weapon, and a lame horse, He told him how to find his wife, and what to do to her and to others. Closing his eyes, the young man crossed a wide stream at one stride! There he found a lodge, where some bad Thunder-men lived. They preyed on the human race. The youth alarmed them by hitting them when invisible, then appearing and vanishing at will. Finally, he made them promise him to eat animals instead of people, under a severe penalty. When he reached the village where the Snake-woman was, he found that she had married again. So he killed her and all the people in the village by brandishing his magic weapon. Returning to the Thunder-men, he found that they still ate human beings. So he banished them from this earth, sending them into the upper world, where they serve men by sending cooling rains and storms in hot weather. On his return home he married the woman of whom his first wife had been jealous. He was killed during an attack on his village. But there is much more of the myth, which was forgotten by the informant. her head, and saw him. The sight killed her at once. Two-faces cut her open, extracted the twins, leaving one at the lodge and taking the other to the forest, to be raised by ground-mice. The brothers met when they were large enough to use the bow. They had several adventures. Their father told them not to visit a certain spring. As soon as he departed, the wild brother persuaded the other one to accompany him to the spring, where they found many rattlesnakes. They cut off the tails, made a bundle, and carried them home, where they put them around the entrance to the lodge. When the father returned, he made them restore the tails to the snakes. Then he told them not to go near a ravine. They disobeyed him, and found there an old woman, making pottery. This "Grand-mother" resembled the "Old Man of the Sea," in Sindbad the Sailor's story. One of the boys took her on his back to carry her home. When they arrived, they could not get her off! They tickled her, but in vain. At last they hit her in the hollow of the back with a stone hammer. Their father, on his return, made them take the old woman back to the ravine. The third day, they went to a tree on a high point of land. It contained the nest of a Thunder-bird, in which were four young birds. One brother climbed the tree, and threw the birds down, after asking each one what its name was. When the fourth bird was thrown down, the tree shot up to a great height, carrying the youth almost out of hearing. The other brother struck the tree with a stone hammer, and pronounced certain magic words, causing the tree to resume its former size. The boys took the birds home, but the lightning in and around the lodge so alarmed the father that he made them restore the birds to the nest. The adventures of the fourth day were not obtained. emerged from the water, and persuaded him to accompany her beneath the surface. As he approached his sister the water separated, revealing a passage to the submarine village. There he was welcomed by the Red Bird, who restored the magic arrow. When he left, the Red Bird gave him four tiny boats, which had magic power. On reaching each of the four villages where he had been entertained, he put a boat into the water, and pronounced some words causing the boat to become very large, when it was filled with all the presents that the youth wished to give to the chief. Each chief gave him a daughter for a wife, but the youth kept three for his brothers, and married one whom he considered the kindest.